ANU CDE MBA, MCA Entrance Test 2017 for Distance MBA, MCA Courses admissions: ANU CDE MBA, MCA Courses admissions 2017, Distance MBA, MCA Courses admissions 2017, ANU Open MBA, MCA Courses admissions 2017. Acharya Nagarjuna University(ANU) distance PG MBA, MCA Courses admissions 2017: ANU CDE MBA, MCA Entrance Test 2017 Notification for the Academic Year 2017-2018, Entrance test hall tickets, Results, Admission notification details @ ANUCDE Website. 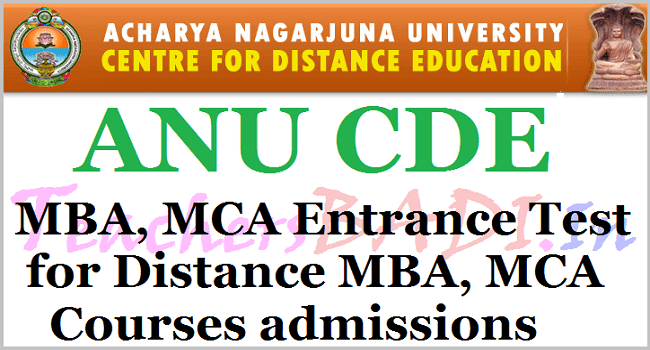 ANU CDE MBA, MCA Entrance Test 2017 Notification 2017: Acharya Nagarjuna University, Center for Distance Education has issued MBA, MCA Entrance Test 2017 notification for the academic year 2017-2018 batch. ANU invites applications from the eligible candidates for admission into the MBA, MCA courses at its Centre for Distance Education, Guntur under the distance mode for this academic year. MBA with Dual Specialization (Marketing, HRM, Finance International Mgt. Exemption from Entrance Test: Candidates with Bachelor's Degree and having 10 years of work experience and Candidates possessing M.Com / MHRM / MFT / MFM / MMM / CA / ICWA / ACS / MBBS / B.L. / B.Tech / B.Pharmacy / B.Sc (Agricultural) with 2 years of work experience after obtaining PG/Professional Degree are exempted from entrance test.